Theresa May given ultimatum by 60 Tory Brexiteer MPs. 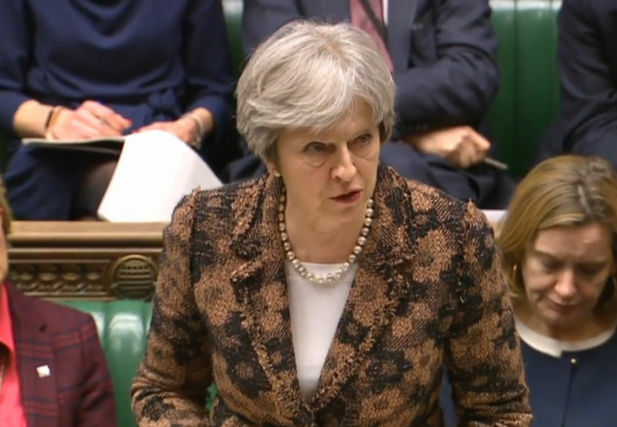 British Prime Minister Theresa May has been warned by Eurosceptics within her own party that a proposed “customs partnership” with the EU after Brexit is unacceptable. Mrs May’s special cabinet sub-committee is meeting to try to thrash out a way forward on the divisive issue of customs arrangements after EU withdrawal. Unconfirmed reports last night said that Chancellor Philip Hammond has thrown his weight behind a customs partnership proposal thought to be favoured by Mrs May but branded “cretinous” by critics. The European Research Group of Eurosceptic Tory MPs has sent Mrs May a report detailing its opposition to the plan, developed by her representative in Brexit talks, Olly Robbins. The ERG’s leader Jacob Rees-Mogg insisted he was not issuing an “ultimatum” to his party leader but stressed his opposition to the option. He told BBC Radio 4’s Today programme the proposal was “deeply unsatisfactory” and would “not get us out of the European Union, which is what people voted for”. With customs arrangements emerging as the key stumbling block to a deal on EU withdrawal, the issue has the potential to split the Cabinet, where Brexiteers such as Boris Johnson and Liam Fox, who are seeking the freedom to strike new trade deals, are pitted against others who fear barriers to commerce in Europe. Although the European Commission has said it wants a solution for the border on the island of Ireland by its upcoming summit in June, there is no requirement on Mrs May to come to a final decision at today’s meeting of the Brexit strategy and negotiations sub-committee. Cabinet Office Minister David Lidington, one of those attending the meeting, indicated a final decision may not be reached – with the full Cabinet expected to consider the issue. Former Conservative leader Iain Duncan Smith told The Daily Telegraph that the ERG report had killed the argument for the customs partnership “stone dead”. Former Brexit minister David Jones told BBC Two’s Newsnight: “Certainly there would be a lot of very disappointed Brexiteers if we were to end up in a customs partnership. Mrs May has insisted that no British prime minister could accept such a scenario. It would also infuriate the Democratic Unionist Party, whose MPs prop up the minority Conservative government in the House of Commons.